It was a rough fourth quarter for many hedge funds, which were naturally unable to overcome the big dip in the broad market, as the S&P 500 fell by about 7% during October and average hedge fund losing about 3%. The Russell 2000, composed of smaller companies, performed even worse, trailing the S&P by about 4 percentage points during the first half of Q4, as investors fled less-known quantities for safe havens. This was the case with hedge funds, who we heard were pulling money from the market amid the volatility, which included money from small-cap stocks, which they invest in at a higher rate than other investors. This action contributed to the greater decline in these stocks during the tumultuous period. We will study how this market volatility affected their sentiment towards T-Mobile US, Inc. (NYSE:TMUS) during the quarter below. Is T-Mobile US, Inc. (NYSE:TMUS) a cheap investment right now? The smart money is turning bullish. The number of bullish hedge fund positions went up by 12 recently. TMUS was in 80 hedge funds’ portfolios at the end of September. There were 68 hedge funds in our database with TMUS holdings at the end of the previous quarter. T-Mobile US was the 19th most popular stock among hedge funds at the end of September (check out the list of 30 most popular stocks among hedge funds now). In the eyes of most stock holders, hedge funds are assumed to be underperforming, old financial vehicles of the past. While there are over 8000 funds with their doors open at present, We look at the crème de la crème of this group, about 700 funds. 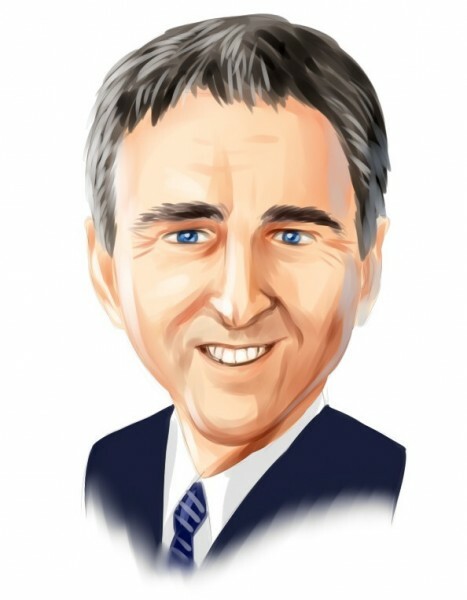 These money managers oversee the lion’s share of all hedge funds’ total capital, and by tailing their highest performing investments, Insider Monkey has formulated various investment strategies that have historically exceeded the market. Insider Monkey’s flagship hedge fund strategy outrun the S&P 500 index by 6 percentage points a year since its inception in May 2014 through early November 2018. We were able to generate large returns even by identifying short candidates. Our portfolio of short stocks lost 26.1% since February 2017 even though the market was up nearly 19% during the same period. We just shared a list of 11 short targets in our latest quarterly update. Let’s take a look at the new hedge fund action encompassing T-Mobile US, Inc. (NYSE:TMUS). At Q3’s end, a total of 80 of the hedge funds tracked by Insider Monkey were bullish on this stock, a change of 18% from one quarter earlier. 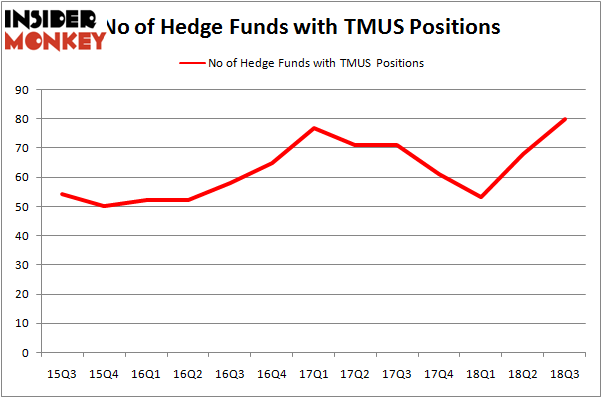 On the other hand, there were a total of 61 hedge funds with a bullish position in TMUS at the beginning of this year. The number of hedge funds with TMUS bets increased by about 50% over the last 6 months. With hedgies’ sentiment swirling, there exists an “upper tier” of notable hedge fund managers who were increasing their stakes significantly (or already accumulated large positions). Among these funds, Citadel Investment Group held the most valuable stake in T-Mobile US, Inc. (NYSE:TMUS), which was worth $428.3 million at the end of the third quarter. On the second spot was Maverick Capital which amassed $363.8 million worth of shares. Moreover, Tybourne Capital Management, D E Shaw, and OZ Management were also bullish on T-Mobile US, Inc. (NYSE:TMUS), allocating a large percentage of their portfolios to this stock. With a general bullishness amongst the heavyweights, specific money managers were leading the bulls’ herd. Jericho Capital Asset Management, managed by Josh Resnick, initiated the largest position in T-Mobile US, Inc. (NYSE:TMUS). Jericho Capital Asset Management had $108 million invested in the company at the end of the quarter. Robert Boucai’s Newbrook Capital Advisors also initiated a $65.7 million position during the quarter. The following funds were also among the new TMUS investors: Crispin Odey’s Odey Asset Management Group, Mark Moore’s ThornTree Capital Partners, and Clint Carlson’s Carlson Capital. Let’s now review hedge fund activity in other stocks – not necessarily in the same industry as T-Mobile US, Inc. (NYSE:TMUS) but similarly valued. These stocks are Raytheon Company (NYSE:RTN), Intuit Inc. (NASDAQ:INTU), UBS Group AG (NYSE:UBS), and Colgate-Palmolive Company (NYSE:CL). This group of stocks’ market valuations match TMUS’s market valuation. As you can see these stocks had an average of 31.25 hedge funds with bullish positions and the average amount invested in these stocks was $1732 million. That figure was $4330 million in TMUS’s case. Intuit Inc. (NASDAQ:INTU) is the most popular stock in this table. On the other hand UBS Group AG (NYSE:UBS) is the least popular one with only 14 bullish hedge fund positions. Compared to these stocks T-Mobile US, Inc. (NYSE:TMUS) is way more popular among hedge funds. Considering that hedge funds are fond of this stock in relation to its market cap peers, it may be a good idea to analyze it in detail and potentially include it in your portfolio.